When implementing a new budgeting software, many often assume that the initial cost of purchase of the software is the most important consideration. However, this cannot be any further from the truth. When implementing a new budgeting software, cost of ownership is the most important element that decision makers should take particular focus on. In this context, cost of ownership means the ease in which a company can use, adapt, and own the new budgeting system. The truth of the matter is that when it comes to a budgeting software, it almost always seems easier when you look at it being demo´d than it actually ends up in reality. Once the new budgeting software is fully implemented and in place, any change becomes too difficult to do and as a user, you basically just have to eventually accept that the new budgeting software you chose comes with a lot of limitations so you need to resort to workarounds or just simply stop using the system altogether in exasperation or frustration. It is logical to want a specific promised capability, such as a rolling forecast for example, to work. True it is there but you can´t seem to get it to work right so then you have to call your budgeting software vendor, negotiate on dates when you bot hare available (which can be mission impossible for some due to consultant´s schedules), you make the change, you encounter errors, you need more meetings, and the cycle continues that you become so tired of this process, you just give up by living with what you have or by not using it and resorting to old ways. One of the biggest challenges of many finance users today is that most Corporate Performance Management (CPM) or budgeting software in the market are consulting-heavy. This is because these products usually is a result of several product acquisitions by a company that in the end it becomes too complex that it needs an expensive and difficult to get a hold off specialist or group of specialists in order to get the system to work as intended. This scenario of constantly needing consultants end up depreciating the value of the new budgeting software due to the degree of difficulty faced when trying to use the system. Any budgeting software vendor will claim that you, as business user, will definitely own the new budgeting system. However, deep within them they know you are never going to fully own the system. It is therefore important to give a lot of time and attention to product flexibility when trying to purchase a new system. It is through product flexibility that you can change certain configurations without necessarily affecting the entirety of the build. The more customised the software is, the harder it is to make changes on your own. The more generally configured the system is, the easier it will be for you or any of your business users to make changes. So when choosing among various budgeting software vendors, make sure they can truly demonstrate true ownership of the system. Let your vendor show you how the system interfaces with other systems for admin and report changes. Ask whether they have a drag and drop wizard that can make making changes or creating views from scratch easy. Can the vendor show you how to deploy? Do you need to leave the screen? How many clicks does it take to deploy? Can the vendor demonstrate how the system can handle YOUR COMPANY´S DATA? A budgeting software vendor that cannot easily load your data in order to show you how the tool will handle your own sample statements usually raises a red flag that this system might need a serious amount of customisations and that the implementation time will be a lot longer than they initially quoted. Can you extend the functionality of the budgeting system? Can it handle automatic consolidation of financial statements? Can it extend from just budgeting to KPIs and dashboards using the same configuration? 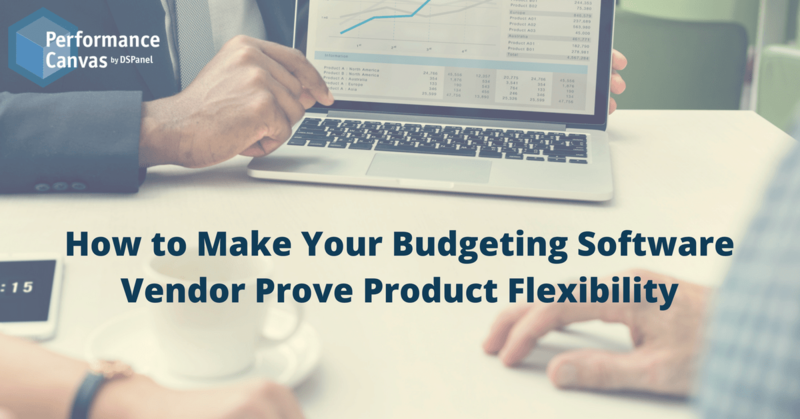 Can the budgeting vendor show you how the modeler works so that if you need to do changes, you know how to do it? Can you lett hem show you what part of the system requires coding? A system that needs a lot of coding on many aspects usually means you are in for a lot of heavy consulting. In the end, take as much time as you need when choosing a new budgeting software and put a lot of emphasis on product flexibility and real ownership of the tool because you might actually end up spending a lot more time and money than you initially thought. To read about the latest and most robust budgeting software in the market, visit www.performancecanvas.com or email info@dspanel.com to see a free online demo.